First time meeting Mike from a forum call Pipit. We knew each other in the forum. He came all the way from KL for MAAD. 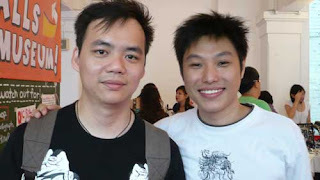 He's one of the administrator of that forum, they do design as well and also very active in KL creative market. This photo taken at the 3 Feb MAAD. Lucky there wasn't many people on that day so that we can chat for quite a long time haha and he gave their forum very first issue brochure to me as a gift. Thanks!